Post card from the late 1950's most likely produced by the Mobile Chamber of Commerce as a promotional item. 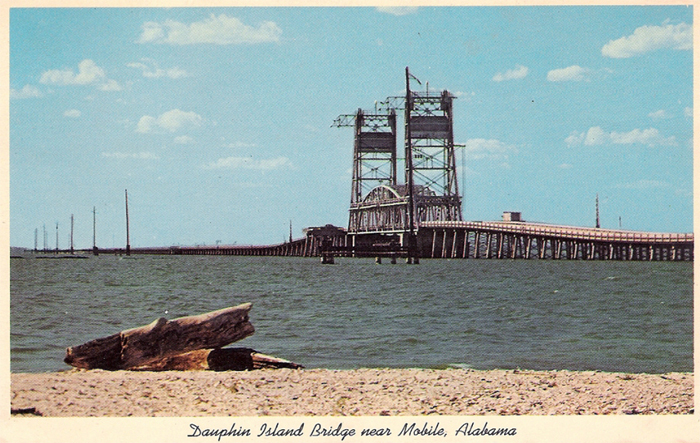 Description on the back says, The Dauphin Island Bridge lift span over the Intercoastal Waterway. This 3 1/2 million dollar bridge which was opened to traffic on July 2, 1955, is an important part of the Gordon Persons Overseas Highway. Dauphin Island lies four miles south of the Mobile County Mainland." Bruce Adkins, Dauphin Island, recalls, "I was about six and remember fishing on it when it was brand new with my grandmother and granddaddy. We fished there for years on many weekends. The bridge tender would come down and chat with us and other fishermen. He fished the channel from his tender house for gaftop catfish. He showed me how he did it and like magic, I started catching them too. It was fun to fish next to the span as it went up and be able to look down at the barges while the span was high above our heads." Adkins says, "That photo was made from the west side of Peavy Island. There was an exit from the bridge on both sides of the bridge, which went down to a small shell island where people parked and camped. When you cross the top span coming to the island and you notice the shallows on the left in a round type shape, that actually blends back into Little Dauphin Island, and curves back to the bridge. That area inside that large visible circle was Peavy Island,, on the shallows on the west side of the bridge was also Peavy Island. Another memory from one who calls himself BeachBumBob, "I also fished on the old bridge many time with my grandfather in the 60's. I remember there were "porches" that stuck out from the sides of the bridge for fishermen, so that you could be out of the way of traffic. We caught a lot of catfish and croakers."